Of the 16 countries that will face scrutiny from President Donald Trump’s administration over possible “trade abuse,” more than half are in Asia. The Association of Southeast Asian Nations (ASEAN) will become the strong driver of global growth in the next decade that also requires massive investments in infrastructure. The British government views Indonesia as a key element for development in the Association of Southeast Asian Nations (ASEAN) region, Great Britains State Secretary for International Trade Dr Liam Fox stated. Philippine security forces arrested a Kuwaiti and a five-month pregnant Syrian for suspected links to Islamic State three months after they arrived, authorities revealed on Thursday. Mae Fah Luang University has arranged the seminar “[email protected] For Now and Posterity” to mark the 50th anniversary of ASEAN. Representatives from global ride-hailing behemoth Uber confirmed the company’s interest in starting operations in Cambodia during a meeting this week with Transportation Minister Sun Chanthol, according to one of the minister’s aides. Cambodia’s economic growth remained strong last year though the Kingdom must now address major systemic challenges to build on its ascension into lower- middle income status in order to maintain healthy levels of development, the Asian Development Bank (ADB) said in its annual report yesterday. Cambodia will need to spend between $500 million and $700 million annually on infrastructure to maintain its current rate of economic growth, Prime Minister Hun Sen said on Thursday, giving a special mention to China for its recent investments. Cambodia cannot continue to rely on low wages to attract investment and must switch to developing skills, infrastructure and innovative industries in order to continue its record of robust economic growth, the Asian Development Bank said on Thursday. Cambodia’s economy is expected to grow by 7.1 percent this year, a 0.1 percentage point higher than that of last year, said the Asian Development Bank (ADB)’s outlook report on Thursday. Li Yong, director general of the United Nations Industrial Development Organization (UNIDO), pledged on Thursday to help encourage foreign investors to Cambodia, a senior Cambodian official said. Cambodian Prime Minister Hun Sen says he’ll focus on securing “connectivity infrastructure” to China’s One Belt, One Road project when he attends a major project forum in Beijing next month, reports the China Daily. While the Kingdom sees the annual provincial voyage undertaken by thousands of Cambodians travelling back to their hometowns in the upcoming Khmer New Year, industry experts are predicting the increase of property transactions when the dust settles. The government’s cap on microfinance interest rates— largely panned as a clumsy policy that could cripple lenders—can nevertheless be an effective signal to the industry to slow down as the public’s indebtedness rises, the Asian Development Bank’s country director said on Thursday. Chevron, the oil giant, has called on a U.S. court to dismiss a case brought by former opposition leader Sam Rainsy, who is hoping to force the firm to release footage of the murder of prominent political commentator Kem Ley, who was killed at one of its gas stations in Cambodia last year. Cambodia has scrapped a long-standing U.S. military aid program amid a diplomatic shift towards Beijing. Videos of a mob beating last week went viral on Cambodian social media as police quelled the violence. Cambodia has scrapped a long-running United States military aid programme in the latest sign of a South-east Asian nation tilting away from Washington and towards Beijing. The Constitutional Court on Wednesday (05/04) ruled that the Home Affairs Ministry can no longer revoke local regulations issued by provincial, city or district administration unilaterally. The Manila-based Asian Development Bank is maintaining its view that Indonesia’s gross domestic product growth will accelerate this year, expecting improvements in private investment and trade. Thailand-based company EGCO has acquired a 20% stake in two geothermal power plants in Indonesia, as part of a deal by Philippines-based Ayala Corp. and Indonesian Star Energy involving the sale of geothermal assets by Chevron in Indonesia. Indonesia is targeting $10 billion (Dh36.7 billion) investments from the UAE in a wide range of sectors including oil and gas, hospitality and power generation, the country’s ambassador, Husin Bagis, told Gulf News in an interview on Thursday. Private lender MNC Bank targets plans to disburse Rp 9 trillion (US$675.32 million) of loans by the end of this year, 55 percent of which will be for the consumer sector. The Indonesian National Disaster Mitigation Agency (BNPB) and the Japanese Earthquake Prediction Research Centre (EPRC) are seeking to cooperate to increase the capacity of early detection system of earthquakes in Indonesia. Coordinating Minister for Maritime Affairs Luhut Binsar Panjaitan has expressed hope that copper and gold mining firm PT Freeport Indonesia will divest 51 percent of its shares to Indonesia before its contract ends in 2021. Indonesia-based Frontier Capital has led a seed funding of an undisclosed amount into Tennova Cipta Inatech, the operator of O2O marketing solution startup Pomona Shopping Rewards. Gemilang Dana Sentosa, who is also a backer of e-payment provider DOKU, has invested an undisclosed amount in mutual funds marketplace and news portal Bareksa. Japfa Comfeed Indonesia, a poultry, and animal feed company, seeks to raise Rp 1 trillion ($75 million) from a bond sale this month to repay maturing debt and acquire working capital. Sales of apartment declined in the first quarter of 2017 as a result of the government charging a new value-added luxury tax, property consultancy firm Jones Lang LaSalle said on Wednesday (05/04). The joint venture will form a company, PT Aneka Petroindo Raya, which will operate as BP AKR Fuels Retail, and expects to open its first retail site in Indonesia in 2018. After a long, bureaucratic process, the Santo Agustinus Pastoral Institute (STP) in Kubu Raya, West Kalimantan, experienced a historic moment on Thursday as it began operations as a government-run educational institution now named the Pontianak State Catholic Institute (STAKatN). Indonesian police have foiled a Mumbai-style terror attack in the heart of Jakarta, which was hatched by a militant from inside a maximum-security prison, a counter-terrorism source told Channel NewsAsia on Thursday (Apr 6). Many young adults in Indonesia grew up playing video games from Japan and America, and some of them loved them so much that they went on to become talented game designers themselves. Nowadays, you can find plenty of Indonesian-themed games from Indonesian designers, especially mobile game apps. Rising Earnings of Indonesian Firms in 2016, More Dividend in 2017? Improving corporate earnings of Indonesia’s listed companies in full-year 2016 should mean shareholders can expect to receive more dividend payouts this year. Based on data from Kustodian Sentral Efek Indonesia (KSEI), so far this year 33 listed companies on the Indonesia Stock Exchange have announced their payout ratio. However, many more are expected to follow. Considering the generally improving financial reports, we expect more companies to distribute dividend in 2017 compared to last year’s 248 listed companies. Indonesias Transportation Ministry has offered investment in some transportation infrastructure projects to Australia as part of the bilateral cooperation under the Indonesia Transport Safety Assistance Package that has been running since a decade. Shareholders have approved PT Surya Semesta Internusa’s (SSIA) plan to sell its shares in PT Bhaskara Utama Sedaya (BUS) under its subsidiary PT Karya Sedaya Sejahtera (KKS) to Astra subsidiary PT Astratel Nusantara for Rp 2.34 trillion (US$175.55 million). The recent hacking of Tiket.com, one of Indonesia’s largest online travel agents, by a group of teenagers and a 27-year-old is just the tip of the iceberg and the incident should prompt businesses to take drastic action to secure their websites, an information and communication technology executive said. The Tourism Ministry has tasked five sustainable tourism observatories with monitoring and improving tourism practices in top tourist destinations in a bid to accelerate the development of sustainable tourism in Indonesia. Freeport McMoRan is awaiting final details on a temporary export permit in Indonesia, which would end a 12-week ban that has cost the world’s biggest publicly traded copper company nearly $1 billion in lost revenues, its top executives told Reuters in an interview on Wednesday (05/04). The US Meat Export Federation has gone the extra mile to fly in a “butcher shop” packed with fresh cuts of prime beef and pork. Indonesia’s tax amnesty has raked in billions of dollars for the government, and all eyes are now on reform that is being planned to improve tax collection in Asean’s biggest economy. If you’re looking to escape the name “Donald Trump,” lighting out to Indonesia is becoming a worse and worse option. The president is in the process of building two new resorts in Indonesia, one of which is a mega resort — that will feature a freaking “Disneyland-like” theme park. Flag carrier Garuda Indonesia has appointed its first ever female captain, the first major Indonesian airline to do so. Nearly a year after Malaysia, Indonesia and the Philippines agreed to launch joint sea patrols to stop piracy and kidnappings by Abu Sayyaf Group (ASG) militants, Malaysian and Indonesian defense officials said trilateral operations would start this month – possibly on Tuesday. The government is creating new decrees to ensure the sustainable development of Special Economic Zones (SEZs) in ways that yield strong benefits. report from the Asian Development Bank (ADB). The president of the National Assembly, Ms Pany Yathortou, received a courtesy call from Vietnam’s leader delegation during working visit to the Lao PDR from April 3 to 7.
border railway project, an Asian Development Bank report pointed out. The Lao government is composing new decrees to ensure the sustainable development of Special Economic Zones (SEZs) in ways that yield strong benefits. The lack of tourists is among the main reasons for the closure of Attapeu International Airport in recent months, according to senior officials. The Ministry of Health and the World Health Organisation to Laos are marking World Health Day, which is observed annually on April 7. The Lao Government poured more than 215 billion kip into the construction of the stadium where the opening and closing ceremonies of the coming 11th National Sport Games will be held, hosted by Xiengkhuang Province. The Lao PDR hosted the 2nd Coordination Meeting for the Thematic Study on the Right to Peace on April 5 in Vientiane. I didn’t go into nursing ignorant of the challenges ahead. I’d witnessed the enormous toll it can take emotionally and physically, and was exposed to the seemingly constant negative press surrounding the NHS about overworked staff and a broken system. Prime Minister Datuk Seri Najib Razak today expressed satisfaction with the country’s economic growth that showed a very encouraging growth. The newly passed Tourism Tax Bill 2017 has to be value accretive to enable the tourism and hospitality industries to thrive, said KLCCP Stapled Group CEO Datuk Hashim Wahir. The World Economic Forum (WEF) has placed Malaysia in the 26th spot in its Travel and Tourism Competitiveness Report, the bi-annual benchmarking index measuring the relative health of 136 countries’ tourism sectors. Malayan Banking Bhd (Maybank) foresees an uptick in economic activity this year, which will bode well for gross domestic product (GDP) growth as well as the finance industry. Malaysia’s economic growth should provide ammunition for the currency to strengthen and measures to curb volatility in the ringgit are currently sufficient, according to one of the nation’s top finance officials. The Dewan Rakyat yesterday approved the Tourism Tax Bill 2017 tabled by Tourism and Culture Minister Datuk Seri Mohamed Nazri Abdul Aziz. Malaysian hotel shares are likely to remain under pressure for a while after lawmakers on Thursday decided to impose a tax on hotel rooms in a bid to boost state finances bruised by low oil prices. Singapore and Malaysian shares fell Thursday, tracking U.S. markets, after the minutes of the Federal Reserve’s latest meeting showed the authority may start paring its $4.5 trillion balance sheet this year. The Philippines and Malaysia took the final step to allow qualified commercial banks to operate subsidiaries in each other’s markets. BY now, even the punters know that rampant speculation is driving up some tech stock prices. But with the market so hot, it would seem that not many may want to miss the party. One play this week is GHL Systems Bhd. Malayan Banking Bhd (Maybank) aims to reduce its provision for bad loans to 50 basis points (bps) this year from 62 bps, said group chief financial officer Datuk Amirul Feisal Wan Zahir. The central banks of Malaysia and Thailand have signed a Memorandum of Understanding (MoU) on Banking Supervision and Financial Development Cooperation, to supervise banking institutions operating in both countries, and foster closer coordination in areas key to ensuring sustainable financial development. The central banks of Malaysia and the Philippines have signed a Declaration of Conclusion of Negotiations deal that paves way for banks from the respective territories to operate in each other’s sovereign jurisdiction. Chinese property developer Country Garden said yesterday a small number of apartment buyers at its US$100 billion (RM443.6 billion) Malaysia project want to cancel their purchases, after Beijing’s recent moves to tighten capital controls on overseas property investments. The Penang state government aims to complete the feasibility study report on the proposed undersea tunnel project within six months. Roast chicken wings are a popular street food in Malaysia, but residents of the town of Sibu are likely to be steering clear of them for a while, The Borneo Post reports. Malaysia’s Customs Department has finally owned up to the improper disposal of a whopping 81.5 tonnes of chicken wings unearthed by Bukit Aup villagers in Sibu, Sarawak two days ago. The conclusion of bilateral discussions in Cebu City between the Philippine and Malaysian central banks is expected to pave the way for the entry of qualified banks in both countries. As the ASEAN bloc enjoys bullish growth rates, China is ramping up its “Belt and Road Initiative” to keep its momentum going. Beauty and Personal care industry includes skin care, hair care, oral care, toiletries and others. With increase concerns for enhanced appearance, the cosmetic products are witnessing an increased adoption among the consumers across the globe. 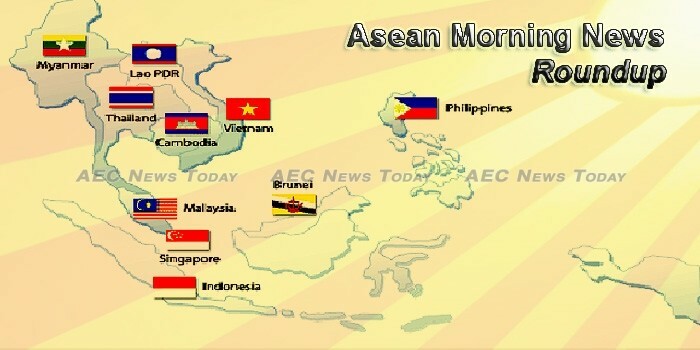 Enjoying a demographic sweet spot with millions of young and educated in the labor force, the Association of Southeast Asian Nations (Asean) is ripe for more foreign investments, Finance Secretary Carlos Dominguez III said on Thursday. Southeast Asian workers are compromising security by using personal devices for work, making organizations in the region highly susceptible to cyber threats externally and internally, said VMware, a company specializing in cloud infrastructure and business mobility. The Philippine government and communist rebels have agreed in principle on an interim ceasefire to boost ongoing peace talks aimed at ending one of the world’s longest insurgencies, a joint statement said. Philippine President Rodrigo Duterte said on Thursday (Apr 6) he has ordered troops to deploy on unoccupied South China Sea islands and reefs claimed by Manila, in a move that could provoke rival claimants including Beijing. The Asian Development Bank (ADB) and two other financial institutions predict the Philippine economy will grow between 6.3 percent and 6.8 percent this year, with the average moderating from last year. A hurting former Interior and Local Government Secretary Ismael Sueno has accepted his fate and without rancor thanked President Duterte for getting him out of the stressful life of government service and enjoy life in his farm. Philippine President Rodrigo Duterte on Thursday ordered troops to occupy uninhabited islands and shoals it claims in the disputed South China Sea, asserting Philippine sovereignty in an apparent change of tack likely to anger China. HINTING of widespread anomaly, the Department of Budget and Management (DBM) on Thursday called for an audit of how the Bureau of Immigration disbursed almost P1 billion in overtime pay to its employees in 2016. Rank and file employees of the Bureau of Immigration (BI) decried what they called “the peddling of lies and misinformation to the public” on the issue of their overtime pay — the non-payment of which has led to long passenger queues in the immigration counters of the Ninoy Aquino International Airport (NAIA) in the past several days. The Anti-Money Laundering Council (ALMC) has turned down the request of Senator Antonio Trillanes 4th to provide his office bank documents of President Rodrigo Duterte. Malacañang on Thursday welcomed the Catholic Bishops’ Conference of the Philippines’ (CBCP) readiness to work with the Duterte administration to address social problems following spats over summary killings and the proposed restoration of the death penalty. An estimated 220,000 farmers will likely benefit from the negotiations between the Philippine Government (GRP) and the National Democratic Front (NDF) — allowing them to lay claim to over 650,000 hectares of both private and public land, which will form part of the two parties’ ongoing peace negotiations under the socio-economic agenda. After allowing members of the Kalipunan ng Damayang Mahihirap (Kadamay) to occupy a government housing project in Bulacan, President Duterte yesterday vowed to use high-powered rifles and bazookas to prevent any new illegal occupation by the urban poor group. MALACAÑANG is conducting its own separate investigation of the allegedly anomalous P8-billion e-passport project of the Department of Foreign Affairs (DFA) over discovery that the project was illegally sub-contracted to a questionable private entity, according to a party-list lawmaker. Giant utilities Manila Water Company, Inc. and Maynilad Water Services, Inc. (Maynilad) finally got the approval on their applications for water rates adjustment that had long been pending amid the lack of Metropolitan Waterworks and Sewerage System (MWSS) board. PHILIPPINE gross domestic product (GDP) growth will likely ease this year — the only Southeast Asian economy that will do so from 2016 — in the face of external headwinds, but the country will still outperform many in Asia and most regional averages, according to the Asian Development Bank’s (ADB) latest estimates. Authorities foiled a possible terror attack following the arrest of a Kuwaiti man and his Syrian wife, both alleged members of the Islamic State (IS). Evasco, NFA feuding over rice importation? His undersecretary got the ax in connection with rice importation, but it is Cabinet Secretary Leoncio Evasco Jr. who is pushing hard for bringing in rice from abroad through private traders during the ongoing harvest season. Safety and security issues have resulted in the decline of the Philippines’ ranking in the World Economic Forum (WEF)’s Travel and Tourism Competitiveness Report. Profit-taking reigned both in the Philippines’ currency and equities markets on Thursday, resulting in little movement of the peso but a drop in the main stocks index. The government and communist rebels buckled down to work on resolving the root cause of the armed struggle in the Philippines – land distribution – before the formal talks in the Netherlands closed on Thursday, April 6. Southeast Asia’s 7,100-island archipelago of under-subscribed beaches and widespread use of English naturally brings tourists. Add in clean hotels with a pool and bar for $30 per night. Five years ago the Philippine government began building on that fame with a slogan to lure more people. The foreign tourist headcount reached 5.9 million last year, up 11% over 2015. But away from the bars and beaches a lot of travelers gripe. They couldn’t get Internet connections. They got stuck in Manila traffic. The cities didn’t feel safe. With the expected influx of people to the Ninoy Aquino International Airport during Holy Week, the airport authority has cancelled the leaves of absence of all its employees to ensure there will be sufficient personnel to handle passenger concerns. The Army seized high-powered firearms and overran a rebel camp in Davao Oriental on Thursday, the military said. The second Zika cluster of this year has been confirmed at Flower Road/Hendry Close, said the National Environment Agency (NEA) on Thursday (April 6), less than a kilometre away from the Simon Place cluster reported last week. Despite forecasts of a hotter and longer dry season, the Governor of South Sumatra has pledged that Singapore and the region will not experience haze arising from forest fires in the Indonesian province this year. For the first time in a decade since the project began, a political violence and terrorism risk map developed by global consultancy Aon has raised Singapore’s risk level from “negligible” to “low”. This is in light of the heightened terrorism activity in the region and recent arrests of self-radicalised individuals in the country. It cruises past a row of parked cars under the blazing hot sun at Outram Road. Suddenly, it stops in its tracks and zooms in on something. Singapore-headquartered digital property firm 99.co has raised $7.9 million (S$11 million) in its latest round of financing, led by existing investors Sequoia Capital and Eduardo Saverin. East Ventures and 500 Startups also participated in the round. There is a growing concern over financial firms in Singapore, with 80% of institutions fearing they will lose revenues to standalone fintech companies. However, almost 9 in 10 banks are planning to increase fintech partnerships, revealed a new PwC report. Sending taste over the web could become a thing sooner rather than later, according to researchers. Vocus Group will begin construction of a $228 million Perth to Singapore submarine cable later this year, while a rival consortium took another step towards its own project. City Developments Limited (CDL) announced yesterday that it has launched the first green bond by a Singapore company through its subsidiary CDL Properties. Singapore-based tryb Capital, a growth-stage technology investor, has made a $4 million strategic investment in Chinsay AB, a cloud-based platform for end- to-end administration of global commodity and freight contracts. Haze in Singapore is contributing to an increase in heart attacks, research conducted by Singapore General Hospital (SGH) has found. GOOGLE has announced it will build a new sub-sea cable network to boost connectivity between Australia and Southeast Asia, as demand for Internet data increases rapidly in the region. United States Defence Secretary James Mattis and Singapore Defence Minister Ng Eng Hen have affirmed the strong cooperation between the two countries’ militaries. DBS Group Holdings Ltd (SGX: D05), Singapore’s largest bank, is going digital and the results are beginning to show. Oil prices soared on Friday after the United States launched dozens of cruise missiles at an airbase in Syria. Lifestyle products firm Osim is relisting on the Hong Kong bourse while Hong Kong’s National Arts is seeking to list its spin-off on the SGX as a business trust. TWO Singapore-based companies announced this week that they have raised nearly US$20 million in Series A funding, a sign that investors are reverting to making huge bets on early-stage startups. The Bank of Thailand (BOT) has signed a letter of intent to enter a bilateral agreement between Thailand and the Philippines under the Asean Banking Integration Framework (ABIF), and also signed a memorandum of understanding with Bank Negara Malaysia on banking supervision and financial-development cooperation. At least 80% of government-issued citizen identity papers in Thailand will go electronic this year, says the Electronic Government Agency (EGA). The education system in Thailand has failed to equip its students with crucial skills for the 21st century job market such as critical thinking, problem-solving and foreign language proficiency due to its educational culture, according to Crimson Education Thailand, a consulting company that helps Thai students win entry to the world’s elite universities. The Constitution Drafting Committee (CDC) has explained why general elections cannot take place in 2017. Finally, the Thai army is to get 10 Chinese made VT-4 tanks worth over two billion baht. His Majesty King Maha Vajiralongkorn Bodindradebayavarangkun has signed Thailand’s 20th constitution, starting the clock ticking for a general election to be held in late 2018 at the latest. Thailand has the safest online advertising environment in Southeast Asia as well as offering the highest rate of viewable ads across both display and video, according to a new study. Thailand is now home to highly analytical traders with $100,000 minimum deposits. Here is what they are looking for in a broker. Rama IV Road is transforming into a new landmark area of Bangkok as it increasingly becomes the location of mixed-used developments combining luxury hotels, retail outlets, offices and condominiums. Thailand Post on Thursday launched a new set of four stamps to commemorate the State Railway of Thailand’s 120th anniversary. Scania Siam Co, the local arm of the Swedish bus and truck maker, is optimistic that accelerated infrastructure investment, recovering exports, higher prices for certain crops, growing tourism and greater Asean trade will help boost demand for heavy-duty trucks. If Brexit is too much for you and you are worried about your status as a British expat in Europe, then Thailand is offering a new home. A pickup truck can carry up to six people in its cab and bed, the government spokesman said on Thursday in an attempt to clear the confusion over the relaxed safety rule. The Industrial Estate Authority of Thailand (IEAT) will do a joint study with the Federation of Thai Industries (FTI) on the development of an industrial estate for a “new S-Curve” industry. Thai Lion Air (TLA) appears to be chasing arch rival Thai AirAsia (TAA) for emerging business out of U-tapao airport in Rayong. The Transport Ministry aims to reduce traffic fatalities by 5% with the enforcement of tougher traffic rules during the upcoming Songkran festival, beginning April 8-18. The Bureau of the Royal Household announced today that until yesterday a total of 5,893,843 people have arrived to pay homage to the beloved King Bhumibol Adulyadej in front of his urn since His Majesty passed away on October 13 last year. The Permanent Secretary for Interior has coordinated with provincial governors to ensure public safety and security during the Songkran Water Festival. President Donald Trump’s withdrawal from a Pacific Rim trade deal was viewed as a glancing blow by Vietnam’s Phu Tai Corp., which makes furniture for Wal-Mart outlets. The knockout punch may come if he follows through on threats of protectionism. Vietnam’s investment firm Dragon Capital has forged a joint venture with Myanmar-based Ruby Financial Company to provide microfinance services in the frontier market. Loi Hein Group’s Ruby Hill Financial will hold a majority stake of 51 per cent in the JV, while Dragon Capital will own the rest. Lending from January to March 23 rose by 3.14 per cent against the end of last year, according to a new report from the State Bank of Việt Nam (SBV). An official has attributed low foreign direct investment (FDI) in the Mekong Delta over the past years to poor infrastructure. The Government has issued a decree on punishments for administrative violations in the minerals and water resources sectors, imposing fines ranging from VNĐ250 million (US$11,125) to VNĐ2 billion ($89,000). The number of applications for recognition of foreign degrees made to the Ministry of Education and Training (MOET) increased by 44 times in 2008-2016. Hanoi Party Committee has recently organized a meeting to collect feedback of leaders of ministries and central agencies, focusing on five years of implementing the 11th Politburo’s Resolution 11 entitled “Orientation and mission for development of Hanoi in the 2011-2020 period” and three years of implementing the Capital Law. Vietnam’s renewable energy production costs remain higher than other countries as the country still does not have a competitive solar energy market. The State Bank of Việt Nam (SBV) will issue regulations on guiding commercial banks to implement a VNĐ100 trillion (US$4.4 billion) credit package with preferential interest rates for high-tech agriculture projects. Việt Nam-based mobile platform provider Appota announced on Thursday it had successfully raised undisclosed funding for its series C round from two investment funds in the Republic of Korea (RoK), according to the Đầu Tư (Investment) newspaper. The Prime Minister has assigned the Ministry of Transport to review and adjust the country’s expressway network plan by 2020 to expand North South Expressway to 6-10 lanes to suit the country’s development demand. Air Asia will contribute 30 percent of the joint venture’s capital, while Gumin holds 69.9 percent of capital and HAA will provide transport facilities. The new air carrier is expected to take off early next year. Valmet will supply automation to Vietnam Oil and Gas Group’s (PetroVietnam) Long Phu 1 thermal power plant project in Long Phu District, Soc Trang Province, Vietnam. The order was placed by OJSC Power Machines (Power Machines), St. Petersburg, Russia, as the general contractor and consortium leader for the project and Valmet’s value-added reseller. Vietnam is cracking down on businesses seeking to evade value-added tax by transacting with consumers through social media sites and messaging services. Authorities in Hanoi will reserve a part of the Thanh Xuan Bac Market in Thanh Xuan District for those street vendors who have been forced off the sidewalks in ongoing campaigns to restore order on the streets. The Ministry of Industry and Trade (MoIT) has added pepper to the list of commodities traded on the Vietnam Commodity Exchange (VNX), according to the ministry’s Decision 1071/QD-BCT issued last week. Representatives from the Trade Office of the Vietnamese Embassy in Argentina had a working session with leaders of the Coto Group to explore opportunities for Vietnamese products to penetrate into the South America country’s leading super-market chain. Prime Minister Nguyễn Xuân Phúc has urged ministries, sectors and localities to work hard to enhance the added-value of Vietnamese rice. An online bargain app for mobile phone users, called hago.me, has been launched, allowing online shoppers to freely haggle with various store owners for a product at the same time. At the same time that India has become as major shrimp supplier to the US market, it has also stepped up exports to Vietnam with shipments in some months even surpassing those to the US.